His comrades in the Army would be first to admit that he has never really been the stiff-upper-lip sort. So when Thomas the strapping black gelding retired after almost 20 years of impeccable military service yesterday, he bowed out in an emotional farewell, complete with goodbye kisses for everyone. 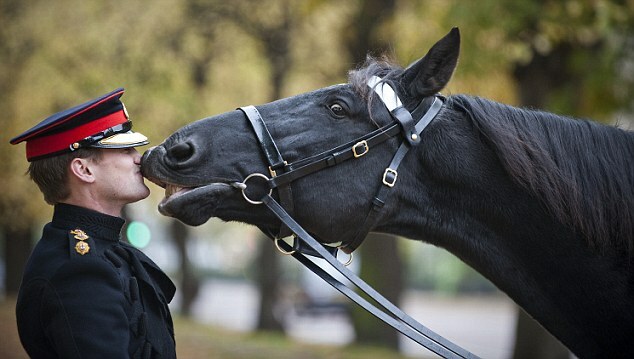 His slobbery smooches for the soldiers looking after him have become the stuff of legend in the Household Cavalry Mounted Regiment. Click Here to read the rest of the article. I blogged last year about both the book and the play. Click here for my book review. Both were excellent. Add in Steven Spielberg and the movie HAS to be great! From the trailer it looks like it will meet expectations. I will review it after I see it, which will probably be on Christmas day as a present to myself. Above is the trailer for a six part documentary entitled “The History of the Horse” that will be on most PBS stations later this year (dates and times TBD). 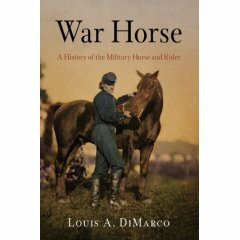 I helped out some with the episode on the horse warrior. I have no idea what the final product looks like but the trailer promises a pretty interesting project. 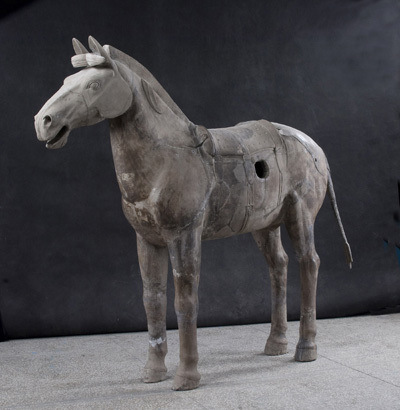 The show celebrates the relationship between horse and human. Whether you own a horse or just love to watch them in the movies, we have a storied partnership with this magnificent animal. This series showcases everything from training tips for horse owners to trail destinations for recreational riders. We visit ranches and other locations where our bond with horses is illustrated in countless ways. Click here to follow to the webpage. The story of Reckless is not only remarkable – it is unusual. And once you learn about her, you will see why the Marine Corps not only fell in love with her – but honored her and promoted her every chance they got. And it wasn’t just the Marines that served with her in the trenches that honored her – her last promotion to Staff Sergeant was by Gen. Randolph McC Pate – the Commandant of the entire Marine Corps. You can’t get higher than that in the Marines. Read the Rest of Reckless’ story Here. There is a little known group of distinguished horses that to my knowledge has never been documented or recognized in any formal way as a group. 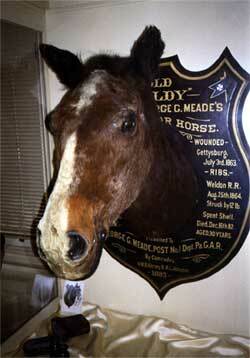 That group is the war horses whose remains have been preserved and are on display. To my knowledge, there are only four American military horses that belong to this group: Commanche, Winchester, Old Baldy, and Little Sorrel. Old Baldy, General George Meade’s Civil War mount at the battle of Gettysburg and throughout most of the war was recently recovered and in the news. He will soon be on display again. Only Old Baldy’s head was preserved after his death. See the story here. Baldy’s display seems to be somewhat half-hearted and makes me a bit uncomfortable. Actually, I’m uncomfortable with the whole idea of perserving the remains of these fine horses. But at least, if its going to be done it should be done completely as an honor, not partially, like a trophy. The other three horses that I know of in this group are displayed with significantly greater care and honor. Commanche was the mount of Captain Miles Keogh of the 7th Cavalry. 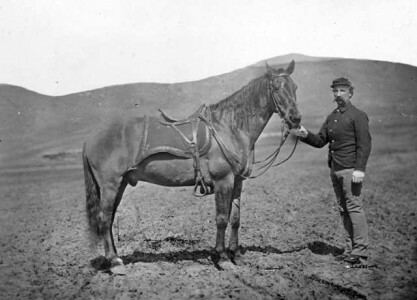 The horse was the only known survivor of Custer’s command at the Little Big Horn. Commanche is displayed at the University of Kansas Museum of Natural History. The museum has recently invested significant effort to ensure the integrity of the display and its preservation. 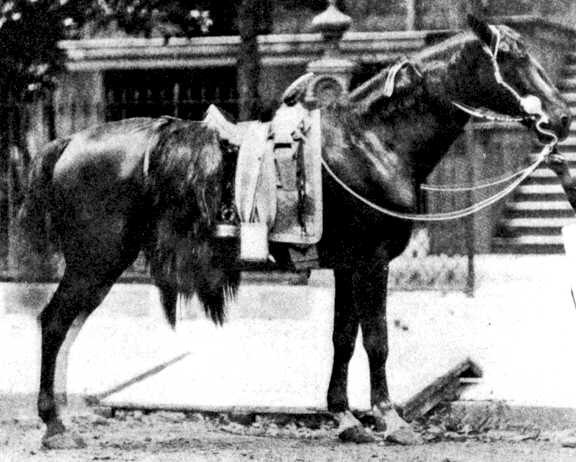 Little Sorrel was the mount of Confederate General “Stonewall” Jackson. 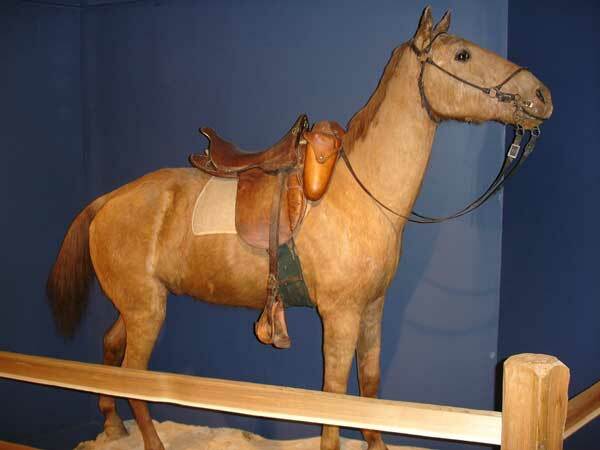 Jackson was killed by friendly sentry fire in 1863 and was riding Little Sorrel at the time. Little Sorrel lived a long life, dying in 1886 at the age of 36. His hid was mounted and is on display at the Viriginia Military Institute. His bones were cremated and buried on the grounds at VMI. If you know of any other American or international warhorses that are on display let me know. XI’AN – Most of the clay horses unearthed from the mausoleum of Qinshihuang, the first emperor of a united China, had been “castrated”, a Chinese archeologist said after studying more than 600 of the life-sized animals. 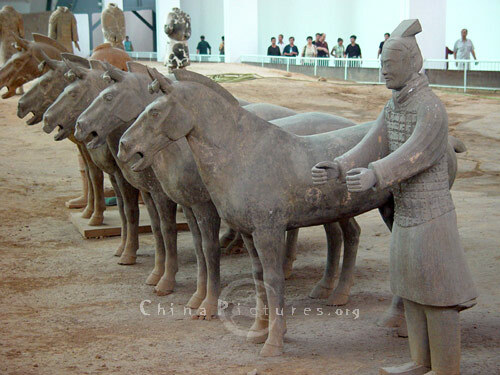 All the 520 horses that pulled chariots in the terracotta army, unearthed from the mausoleum on the outskirts of Xi’an, capital of the northwestern Shaanxi province, had penises but no testes, said Yuan Jing, an archeologist with the Chinese Academy of Social Sciences. 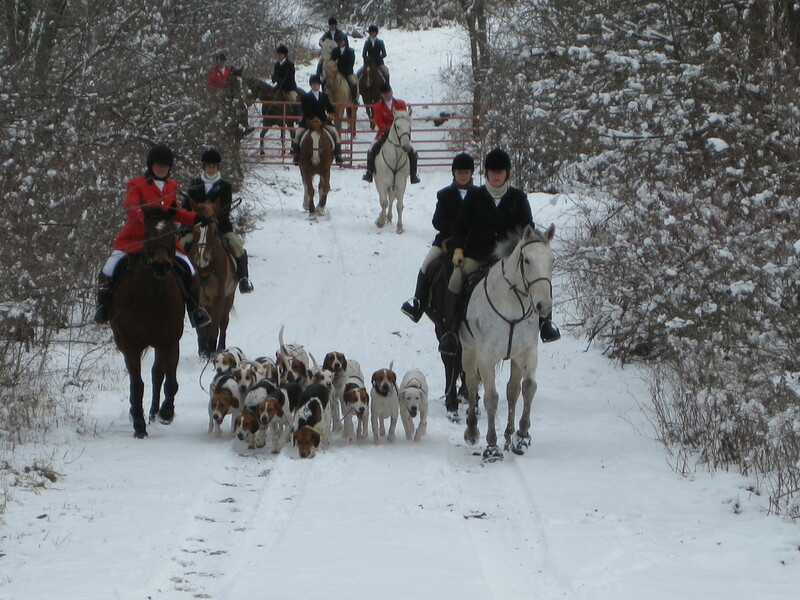 The Fort Leavenworth Hunt out two weeks ago after one of this winters many snowfalls. Some times my various interests collide in interesting and unusual ways. 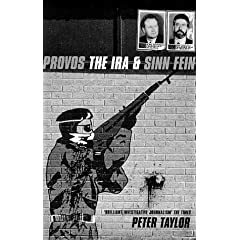 Recently I was discussing IRA bombing tactics as an example of the militant wing of an insurgent group dominating its political wing. Nothing probably demonstrates this better than the July, 1982 bombing by the IRA of the British Household Cavalry guards. The below is the report from the BBC as to what happened. 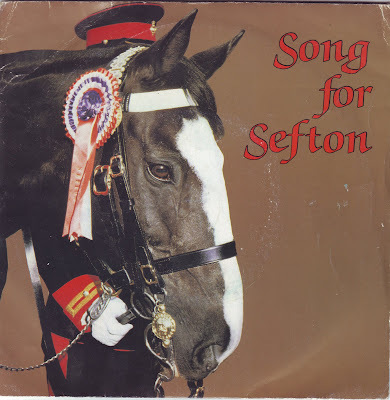 One of the survivors was the Household Cavalry horse Sefton. See his story here. The interesting aspect of this bombing is that it is really a major tactical mistake by the IRA. Not in the sense that it didn’t achieve their objective of bring publicity to their campaign. That was a tactical success. But it was a mistake in the strategic sense. Killing horses and bandsmen had a huge public backlash against the IRA. Even among the Catholic community of Northern Ireland, a bastion of IRA support, few could have sanctioned killing horses and bandsmen. Especially when many of the horses were Irish breed. This attack makes the point that terrorism is really about information operations. The side that manages the message the best wins. Attacking bandsmen and horses is a terrible message. 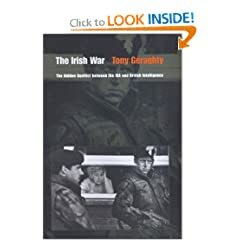 In the years after 1982 the British army and government became expert at turning such IRA attacks against the terrorists. The British were able to make such actions a net loss to the terrorists among their own supporters by carefully exploiting the negative images of the attack while avoiding an overt response to the bombing which would have increased support for the terrorists. See this discussion to see how the British strategy against the IRA changed over time. 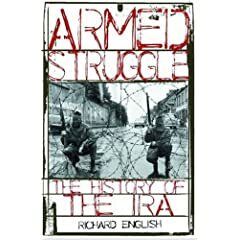 Many Americans were too young or have forgotten how savage the battle between the British and IRA was. This might be a reminder.